Added the ability to browse through items when in the Stock Status Inquiry. The first time in the application the user must provide the item number and the location. 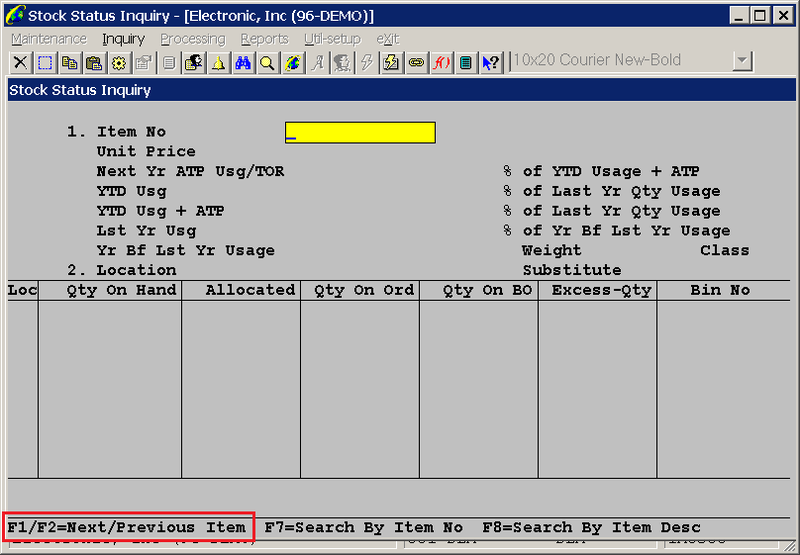 Once the user escapes back to the Item Number field, they will have an F1/F2=Next/Previous Item option. If the F1 key is pressed, the next item number in the Item Master is shown. The location field will be skipped and the previous location entered (spaces for all, wildcard, or specific location) will be used. Pressing Escape will take the user to the location field where it can be changed. The user must hit Escape again to return to the Item Number field. This process is stopped with an error message if the end of file is encountered. If the F2 key is pressed, the the previous item number will be shown, and the process described above will be followed. If the beginning of the file is encountered, the process is stopped with an error message.